Administrators can remotely enable and turn on Remote Desktop (Terminal Services) in remote computer or server in another or off-site location via network to accept incoming RDC connection. However, if manually editing the remote computer registry is not your cup of tea, or you’re facing error opening or editing the registry key value as required, here’s a few freeware utilities and tools which can be downloaded and used for free to enable (or disable) remote desktop or remote PC remotely, some even comes with more versatile functions. This program allows to enable the remote desktop feature of Windows 10, Windows 8.1, Windows 8, Windows 7, Windows Vista, Windows XP, Windows Server 2016, Windows Server 2012, Windows Server 2008 or other older OSes – remotely. RD Enable XP allows user to enable Remote Desktop connections on a remote computer running Windows operating systems beginning from Windows XP, and tested to Windows 7 Professional Editon but should also works in Windows 10 Pro. It’s designed for use by administrators within a domain environment using computer or IP address. Able to force Windows Firewall exception to allow Remote Desktop Connections client with the installed licensed copy of PsExec. A command line option, RD Enable CL, by the same author is also available. Replace computername with actual computer name. Replace [ComputerName (in FQDN format)], ComputerName or HostName with actual computer name or host name. 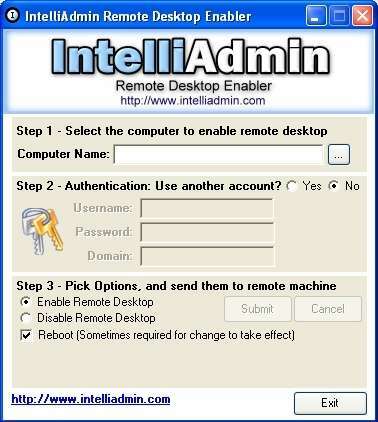 Note that for remotely enable Remote Desktop feature to work, user must log on to the local computer with an admin account or user account of local admin group that has administrative privileges on the remote computer. An easy to use command script to remotely modify the remote system registry to enable and turn on Remote Desktop for multiple servers, computers and PCs at one go. where Computer1, Computer2 and ComptuerN represents the host name or computer name to remotely enable their Remote Desktop. 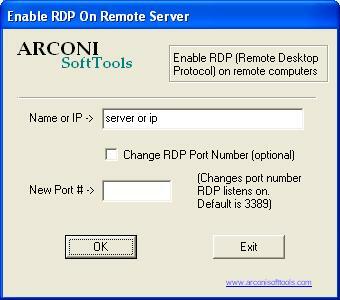 Allows user to enable Remote Desktop connections on remote servers using IP address or host name, change the port number that RDP listens on and add users to the “Remote Users” group on the local system.